The Perfect Place by Teresa E. Harris. Review: Treasure is a 12-year-old girl who has courage and strength. Her father left her, her mother, and her 7-year-old sister Tiffany alone. Treasure feels like since her father left she has taken over the role of a parent. She walks Tiffany to school everyday, buys the groceries, and makes sure that there is food on Tiffany's plate. Treasure's father is somewhere out there and she wants to find him. When Treasure's mom takes her to her Great aunt's house -a place she thought she would never go- Treasures life is turned upside down. Will Treasure ever turn it around again? 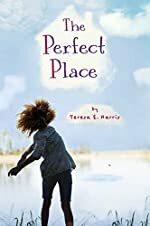 In The Perfect Place by Teresa E. Harris, Treasure learns that she has to find happiness; happiness will not always come to her. Treasure and Tiffany are left in the dust when their father leaves them with their mother. Leaving the apartment is not easy; the only way for them to get out is to sneak out at night because Treasure's mom is not paying the bills. Treasure's dad has left her family many times before, but he had never been gone for this long. Will Treasure be able to escape from her life? Will she ever be able to find her? Treasure has been forced to grow up to fast and leave her childhood behind. The Perfect Place is a great book for someone who enjoys books that include surprising endings. I enjoyed this book so much because of its moral, which is you have to find happiness; happiness will not always come to you. Thanks to Theresa E. Harris I now know that if I wish for it, I can find happiness. This book has some rough language so I recommend it for ages 12 and up. The Perfect Place is such an amazing book from its details to its characters to its moral. I hope to find more books written by Theresa E. Harris. We would like to thank Houghton Mifflin Harcourt for providing a copy of The Perfect Place for this review. Have you read The Perfect Place? How would you rate it?